The Hillhead & Dales Light Railway has been around since 1993, in one guise or another. The current version came into being during 2007. This page will evolve over time as I add sections - it probably won't ever be the definitive guide to the H&DLR, more a collection of mini projects that I hope are of interest. All the stations on the H&DLR are lit, as are most of the non railway buildings. Everything is powered by a Helmsman16v a.c. transformer. This is well suited to LGB, Pola and Busch "G" scale lights. However, not all the lights come from these sources. At Birkenhof station, the bulbs are a real mix. Under the canopies are 2 x 12v bulbs in series. These shed a nice amount of light and I'm pleased with them. Over the name boards are some 3v bulbs (4 in all) and a resistor, in series. They're a bit feeble but the lamps are rather nice - they are model boat fittings. The standards have 12v grain of wheat bulbs by Miniature Scale Models. Originally, I wired two in series, but the result was, I felt, a bit too feeble - I really wanted them to shed light onto the platform in the way that the ones under the canopy do, but they simply didn't. So, when I rebuilt the station platform, I experimented with adding a resistor. With some help from the manufacturer we arrived at some suitable values, and the result is that they're now drawing around 10 volts - brighter than previously, but not too bright. There's also a Pola 16v pole lamp just out of shot which does a very good job of shedding light onto the station. However, the Piko station building kit is barely 1:22.5 (I've modified the windows because otherwise it betrays its 1:32 origin) and so a large lamp (LGB, Busch, Pola...) too close dominates the underscale building. The camera lies (or I'm too fussy). Meanwhile, at Dottendorf, the village is positively aglow with lamplight. Platform lights are courtesy of Busch. Interior lights are either 18v LES bulbs (now sadly hard to get hold of) or 12v lamps, generally wired with two bulbs in series. On the church wall, I was going to use a Brandbright kit but after umpteen attempts to get the thing to stick together I threw it away and made something far more suitable in a fraction of the time out of scrap plasticard. Since taking the photo above, there have been a few changes. 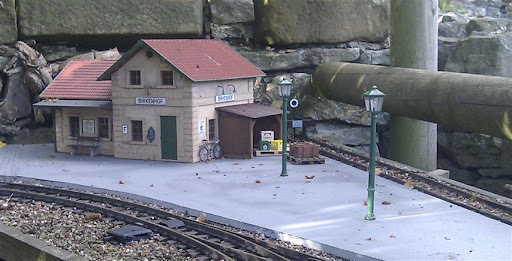 The Pola lamp succumbed to a critter and has been removed, while a new signal box or block post has been installed, and can be seen at the right hand end of the picture below. This has a couple of 12v lamps under the canopies over the doors, in series as is my usual way of using these, and a rather nice Champex Linden lamp to light the way up the wooden steps. Round at the little halt of Holzapfel, there are just two lights - one under the canopy of the shelter, and one on the buffer stop. These are both 18v LGB bulbs, and so there's no need for resistors, wiring in series or anything. They give just a nice amount of yellow lamp light. Austrian and German railway timetables have long been in simple departure time order, so rather than posting the whole "line of route" timetable, a version is printed for each station. The timetables for each station were printed out onto self adhesive vinyl, stuck onto a brass plate (I discovered that plasticard tended to warp), wrapped in clear sticky back plastic (I watched Blue Peter too), and affixed to the station walls. So far, so traditional. But the H&DLR tries to keep up to date with best practice, so a new LED based Customer Information System has been purchased and will shortly be installed at Dottendorf. Yes, I realise it isn't precisely to scale. It's a bit of fun. For a preview, see http://hillheaddaleslightrailway.blogspot.com/2011/01/latest-technology.html.